If the eyes are the window to the soul, then the eyebrows are the window treatments. When Cranston, Rhode Island’s own Olivia Culpo enjoyed a meteoric rise from local pageant girl to Miss Rhode Island to Miss USA to ultimately Miss Universe (and now, bonafide , her perfect arches made quite an impression. “Completely hypnotic” described Glamour magazine. Then just this week, the magazine asked, “If These Eyebrows Aren’t Everything, We Don’t Know What Is.” (It’s Lipstick.com’s first-ever Eyebrow Week, in case that wasn’t already marked on your calendar…) Her enviable arches are credited to the handiwork of Mari Capuano at Rinnovo Salon in Culpo’s hometown and allegedly maintained by celebrity makeup artist Robert Sesnek now that she’s hit the big time. Equally captivated by Culpo’s awesome arches and paired with a skimpy set by comparison, I was intrigued when I discovered the Chella Brow & Eye Collection at the unveiling of the newly branded SpaFjör at The Hotel Viking, (at left). Color kits to conditioners, heated curlers to highlighters, masks to mascaras, and tweezers to treatments are made by Chella which has brow bars worldwide (none are local but we have the amazing teams at ArchBeauty and The Apothecary)! Soon, I was tearing into a “Ciao, Perfect Brows Eyebrow Treatment Kit” (at right) which includes a 6mL tube of Prostaglandin-Free Chella Brow Full-Fillment Eyebrow Treatment, 4 eyebrow stencils and Chella’s Beautiful Eyebrow Instructional DVD all in a custom tri-fold Chella Eyebrow Organizer with 8 individual pockets. After watching the DVD, and with the help of the stencils (so fun to play with these! Some are more dramatic than others and I found it best to use the stencils as more of a helpful guide). The only items the kit doesn’t come with the eyebrow pencil and/or power which makes sense as you’d be more inclined to get the shades that match your hair color/skin tone best. I was most intrigued by the eyebrow treatment which indeed conditioned the brow (it’s a non-irritating soft gel that goes on at night). After about 6 weeks, I saw a definite improvement, though Chella recommends allowing at least 90 days to let the treatment fully work it’s magic. The pieces from the kit can be bought separately as well, so if your awesome arches are already in the Brooke Shields brow stratosphere, you won’t need the treatment but can benefit from the myriad Chella eyebrow, eyeliner and shadow collections plus lash treatments, masks, tools and more. 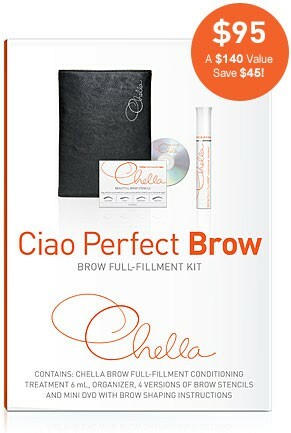 For more brow-wow, follow Chella on Instagram and Twitter (both: @ChellaBeauty). NEWPORTERS: August is Local Appreciation Month at SpaFjör at The Hotel Viking! 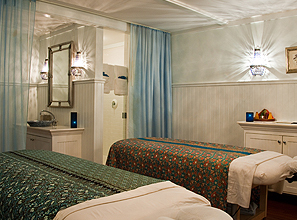 Enjoy a 50-minute Ocean Breeze Massage, 50-minuteSea of Life Facial or Coconut Manicure and Pedicure for just $99 (INCLUDING gratuity) and a glass of champagne! Disclosure: I was provided a complimentary Chella Perfect Brows Eyebrow Treatment Kit for purposes of this review. Opinions expressed are independent and my own. Entry filed under: Uncategorized. Tags: chella eyebrow reviews, Chella eyebrow stencils, chella eyebrows, chella lashes, chella promo code, Chella Prostaglandin-Free Chella Brow Full-Fillment Eyebrow Treatment, Ciao, Newport ri, newport ri archbeauty, newport ri bridal makeup, newport ri eyebrow treatments, newport ri eyebrows, newport ri Lakuna, newport ri lashes, newport ri makeup newport ri spas, newport ri spa fjor, newport ri spa specials chella beauty, newport ri spa terre, Olivia Culpo eyebrows, olivia culpo miss Rhode Island, olivia culpo rinnovo salon, Perfect Brows Eyebrow Treatment Kit, RI Olivia Culpo, spafjor newport ri, The Apothecary newport ri.